With over 1 million heroin users in the U.S., heroin-related deaths are skyrocketing, made possible in part, as McCarthy says, by the cheap supply of heroin, governmental regulations, and Fentanyl-infused heroin (50 times more potent than heroin). 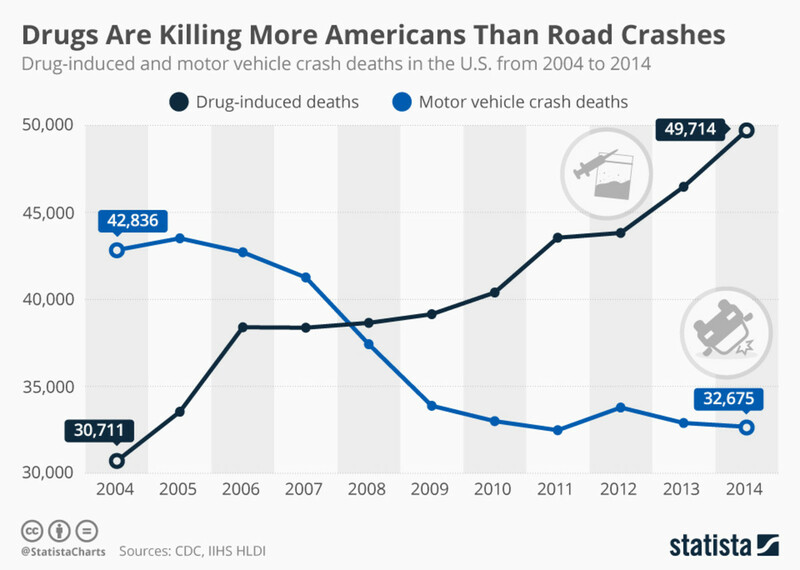 While progress is being made to reduce deaths by vehicle, with safer vehicles on the road and the future promise of driverless vehicles, very little is being done to curtail the rising deaths from opiates. McCarthy says many of those deaths are attributable to the government’s insistence opioids be manufactured differently. “It involved changing the texture of the pills to make them more difficult to crush and inject into the bloodstream. That move made people shift over to heroin in droves,” he wrote. But there seems to be hope for heroin and opiate addicted Americans seeking to beat their addiction. As The Free Thought Project has reported, Kratom, a highly beneficial naturally grown plant, shows promise in helping addicts defeat their disease. Kratom, when taken in pill, tea, or tincture form, has opiate-like properties, which help users curb their cravings for heroin and opiates. Public outcry kept the federal government from classifying Kratom as a narcotic in September, but it’s anyone’s guess whether or not the new Trump Administration will push through its original plans to outlaw yet another plant. For now, Kratom is still available. Americans’ struggle with opium and heroin addiction goes all the way back to the American Civil War, when soldiers on the battlefield were given opium-derived morphine for pain. Morphine gave way to the creation of Methadone in 1937. And then in the mid-80’s into the 1990’s, the pharmaceutical companies created synthetic opiates: Vicodin, OxyContin, and Percocet. In America, opioids are readily accessible, simply by complaining of chronic pain. And with marijuana’s proven ability to treat chronic pain, why wouldn’t the federal government remove its ban on cannabis and allow marijuana to be sold legally in all 50 states, not just the 29 or so which now have medical marijuana options? Americans need to become aware that marijuana may be a safer option for treating pain, and may also serve as an alternative to heroin and prescription based opiates. The stigma associated with marijuana must be removed, availability readily accessible, and the fear of being arrested and prosecuted for marijuana use removed. For now, heroin and opioid addicts should investigate the benefits of using Kratom as an all-natural option to treat their opiate addiction, and stay alive.